With the final of Bake Off fast approaching I felt compelled to get myself in the kitchen this week. As we creep into autumn thoughts turn to fruit pies and crumbles. One thing I love about being in the countryside is that you’re never far from a blackberry bush, and what pleasure is greater than plucking a big juicy-looking berry and popping it in your mouth. Part of the joy has to be down to the hunt for the ripest looking ones (often standing on tip-toes, precariously leaning into the bush) and the accuracy required to not get prickled! I saw this Tom Kerridge recipe for a toffee apple crumble tart aaaaages ago and really fancied adding a cheeky bit of toffee to my crumble. It’s definitely a treat for this autumn. Anyway, this idea evolved (as they do) into making biscuits. 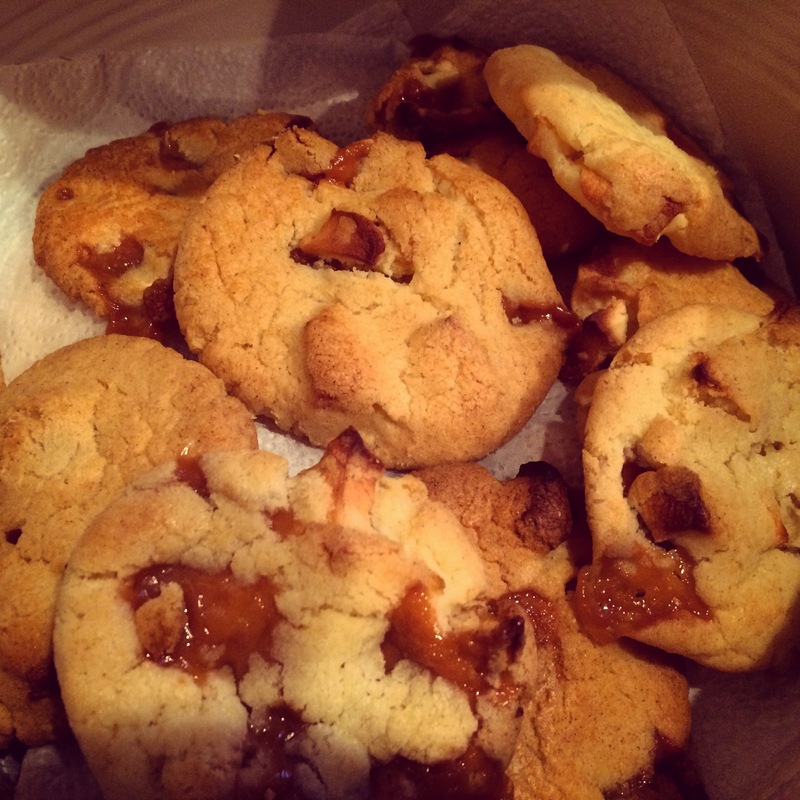 I found this recipe for toffee apple cookies on the Good Food website and ended up having a bit of a late-night baking sesh. They didn’t last long at all as we ate about half of them fresh from the oven when they were still warm and crumbly. The next morning, by which time they had obviously cooled, the biscuit had firmed but the toffee had gone all lovely and chewy. When we were little my mum had a Sun Pat recipe book. I wonder if Sun Pat still exists?? Anyway, it was a brightly coloured Lichtenstein-style one which I presume had come with (or been sent off for, as you did in those days) a jar of crunchy peanut butter. I can’t really remember which recipes were in it- peanut butter milkshake maybe? The only thing which sticks in my mind, and the only thing she made from it as far as I remember was the most gorgeous peanut butter cookies. I’m going to have to trawl through her massive stash of magazine cutting recipes to see if I can find it. After all that I arrived at the idea of this cake. I was imagining quite a dense but moist sponge, a crunchy butter cream maybe… ooh how about a layer of strawberry jam to give it the peanut butter & jelly vibe? 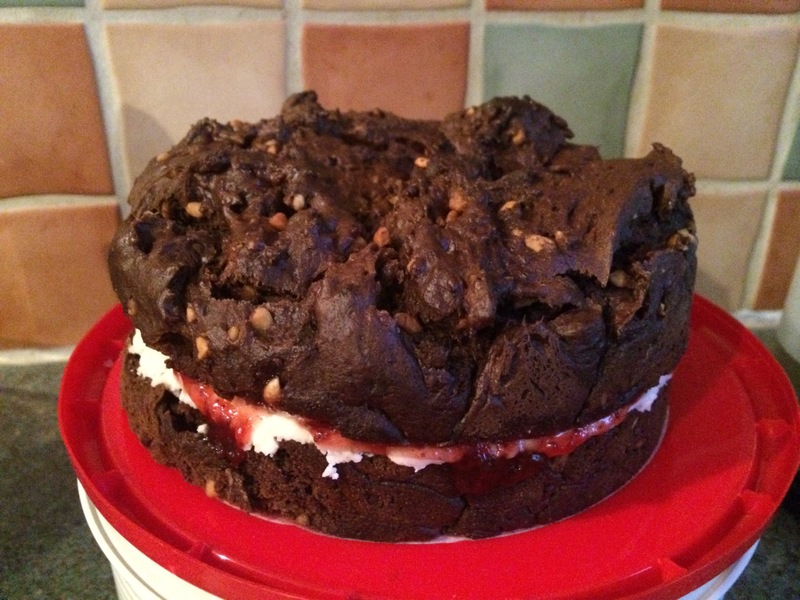 I did some Googling and found this rather yummy sounding chocolate and PB cake. I won’t post the link as it was horrible! And I won’t disgrace the celebrity chef it belongs to either. Honestly, I was so disappointed as I thought it looked lovely- all chocolately and studded with chopped nuts. I love the way it set exactly as I had dolloped it in the tin. Sadly the texture was really gluey and the smell which you sometimes get when you use cocoa powder was something like the smell of concrete!